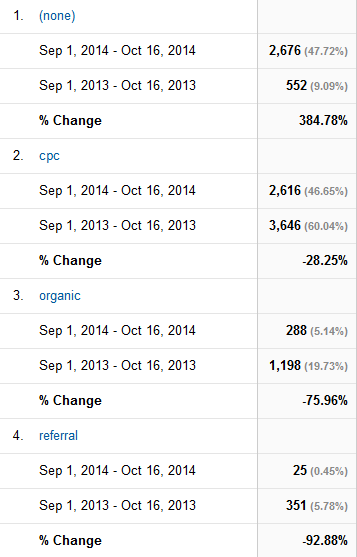 Why is Google reporting traffic shift from Referrals/Organic to Direct? Thread: Why is Google reporting traffic shift from Referrals/Organic to Direct? This is something that has been confusing me for a few months. My traffic has basically shifted from a somewhat even mix of Referrals, Organic, Direct to an almost dominant number of Direct. Referrals and Organic Search visitors have declined at almost the exact same rate that Direct has INCREASED. This started in early July, and I really have no idea why it's happening. For instance, prior to July 10th, I was getting 10-12 referrals on average, per day. Since then, it's more like 0-2 if I'm lucky. Can anyone think why this would happen? I can't imagine any of the algorithm updates causing this to happen, but maybe it did. Perhaps some of the referrals I was getting before were being counted when they shouldn't have been? A switch to universal analytics was done, but I believe that was done months prior. Even then, I can't see that making a difference. Without any genuine data to support any educational conclusion... you are likely spamming. Where did you content come from? What types of promotions have you done? Are there ads on your website? Are there keywords in your domain name? Without exact information about these you are the only person that can answer your questions because you have all the data. I'm not sure what you mean by where my content came from. If by links, you mean backlinks, then all that has changed, is MORE have been created since last year. The only promotions include AdWords and AdCenter campaigns. Both of which have maintained a steady number of visitors. These numbers have remained stable. Yes, the ads are as I mentioned above. No, there are no keywords in the domain name. I was asking if anyone has experienced a similar shift in traffic. Something similar happened a year or two ago: check this out. Accusing me of spamming is a bit standoffish. Not really sure what I did to deserve that. GabrielG  agrees : Way to keep your cool re spamming accusation. Have a look on the resources from where you were getting the referral traffic, check if they were the same resource sending referrals to your site. Check if your site still ranks for your KW in SE. During the month of Feb and March this year I was getting 20 to 60 click per day from a single site where I have commented my views and dropped a link. That blog uses commentLuv, I found there were only few clicks recorded on that link by commentLuv but blogger and analytics showed daily traffic from same resource. I asked the webmaster of that site to remove the link, as it was sending automated virtual traffic to my blog, once the link was removed my referral traffic came back to normal. Check out your referral traffic sources, may be links from sites where you were getting the traffic were removed. And you have lost ranking in SERP. Or may be this theory is useless for you, and there is some glitch with Analytics tracking. Maybe this will help clarify things? SERPS have actually improved since and as for referrals, a LOT of them are reporting 0:00 avg duration and 1 page per session now, whereas they weren't before. Is Google tracking 301's as direct traffic? So the majority of my clients have 301 redirects for their route domains, which redirect traffic to URLs such as http://www.domain.com/home.html. So when anyone types in domain.com or www.domain.com it will redirect to a single URL. Has google started tracking those 301 redirects as 'direct' traffic? All of my referrals and organic traffic has plummeted, but my direct traffic has gone UP by about the same exact amount. Visitor from referral source > domain.com > 301 redirect to www.domain.com/home.html. This would originally be tracked as a referral, but now it's showing up as direct. Is there a better way to handle this? EDIT: Also, I'm looking at % New Sessions and the numbers are down across the board (except for Direct) from 50-60% to about 3-5% YoY. Last edited by bibowski; Oct 21st, 2014 at 03:03 PM. Yes it will show up as a direct traffic if you want to track the redirect traffic you have to set up URL parameter for 301 redirect. Last edited by olivier-666; Oct 30th, 2014 at 12:36 AM. Why would I put the source as 'hyload'. Do you work for hyload.com or something? Chill dude - it was just an example. Probably had his main work site on the brain . To your original (and very good) question - the idea of 301ing to a page that has paramaters attached at the end is a good idea. Another possibility is to ask the sites linking to you to update to the new URL if they don't mind. Merged the two threads on this topic. I'm still experiencing the same issues. Has anyone else had the same thing occur, with a solution that worked? Google PPC traffic Vs Organic Results traffic?